Senior activists of several advocacy groups stormed into the civil society consultation, being held to “review” and “update” the World Bank's environmental and social safeguard policies organized by the World Bank at India Habitat Centre in New Delhi. Terming these consultations as “eyewash”, these activists didn't allow the consultations to proceed, because they felt that the World Bank continues to hide behind the central and state governments in India or other government agencies in different countries and shirk responsibility for environmental and social damage. 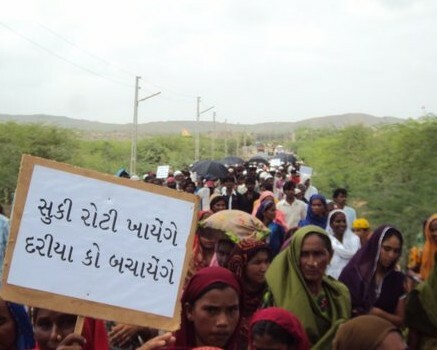 In fact, the Bank, has “further endorsed such environmental crimes by offering a $1 billion loan to the building of the Fifth Power System Development Project, which essentially is a transmission line for Tata-Mundra and three other large coastal power projects. Participating in such manner, the Bank conveniently escapes any blame for the disaster, and yet benefits from financing such ‘development projects’”, he said. Voluntary agencies which came together to protest against the Bank’s ways, apart from NAPM, were the Matu Jan Sangathan, the Domestic Workers Union, the Delhi Mahila Shahri Kaamgar Sangathan, the Delhi Solidarity Group, SRUTI, Delhi Forum, Programme for Social Action (PSA) and others. Activists urged members of civil society, who had come for the consultation, to leave the meeting, if they really felt the pain of the people of this country. “The Bank has pushed for policies which have undermined the sovereignty of India and its people, privatized services, opened up market for loot and plunder of natural resources by the private corporations and very fundamentally changed the policies of this country in favour of capitalists forces”, they alleged. Shouting slogans of “World Bank Quit India!”, “World Bank Down Down!” activists refused to budge from the venue until World Bank Country Director Onno Ruhl, left the hall at 2 pm followed by Stephen F Lintner, Senior Advisor, Sanjay Srivastava, regional safeguards advisor and other Bank officials along with few civil society organisation members and Bank consultants who stayed till last. “The current ‘consultations’ are therefore a sham and must be denounced by anyone deeply concerned about the nature of democracy and are keen to ensure that all peoples of the world benefit from human activity that is based on deep appreciation and adherence to the principle of prior and informed consent and the principle of intergenerational equity”, it added.